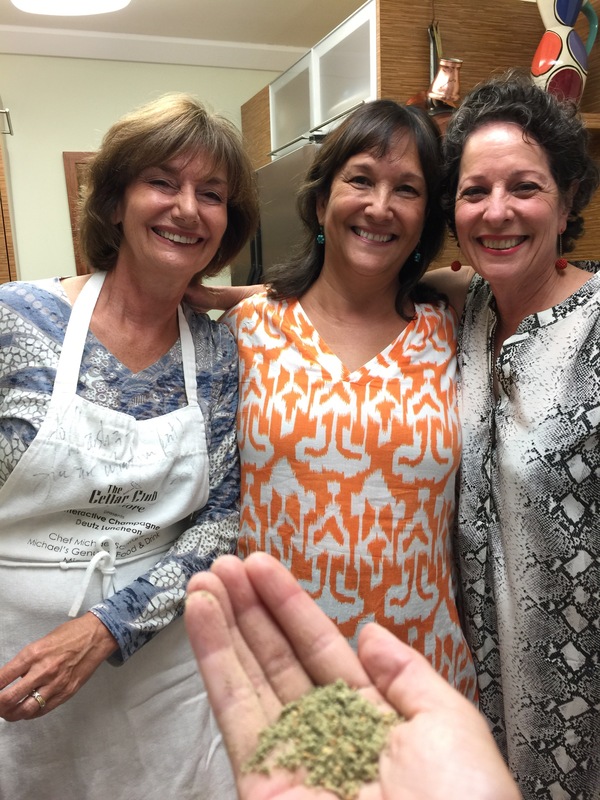 Last week I had the pleasure of cooking dinner for five inspired by my trip to Israel. It was a bit of a celebration as all guests had cause – big moves and big trips. Israeli cuisine was the only call! Where to begin with the menu was the question. Any rhyme or reason would have been useless with the amount of wonderful dishes and ingredients I had tasted for the first time and wanted to bring into my home kitchen. So, as usually does the trick, the only answer was to go on sheer instinct and let the rosé guide me on the dishes and their preparation. I focused on making use of spices purchased at Tel Aviv’s Carmel Market – za’atar, baharat and paprika – and two vegetables we constantly encountered in the market and on the table, in myriad ways across the country – cauliflower and eggplant. You’ll find very rough recipes below. They were thoroughly enjoyed by a gaggle of special home cooks whom I have always admired and learned from in the kitchen, making the meal all the more a sweet success. All of these dishes can be made or components readied a day ahead of time if you are pressed for time on the day of an impromptu dinner party! The beauty is they may even taste better that way… And please start the meal with some warm pita and dishes of tehina and za’atar-spiked great extra-virgin olive oil, on the greener side if possible. Lily mixes up condiment-style tehina by adding lemon, garlic and salt to the raw sesame paste which you can buy in the store. Lily also tipped me off to two Israeli market groceries that I will be visiting soon to hopefully replenish my pantry with some vestige of authenticity and keep the smells nice in my apartment — they are both in Aventura: Sarah’s Tent and Kosher Kingdom. Thank you to Gilt Travel for allowing me the opportunity to share my Israeli travel experience in a story for its blog. Find it here and please enjoy this more personal account of our trip! L’chaim! – Chop cauliflower into 3 large chunks of even thickness – not whole and not florets. This is to get a little more caramelization but not kill the firmness. Also cut one orange in quarters. Place all on a sheet tray and generously douse with some OK Italian extra virgin olive oil such as Lucini or Whole Foods/Fresh Market private labels. – Roast until browned on tips and slight tender, with oranges starting to char, about 25 minutes. – While the cauliflower and oranges are roasting, make the dressing. In a bottle you can shake. Mince capers. Dice shallot. Chop green onion. Dice preserved lemon. Add a little red wine vinegar. Add salsa picante (this is a bottled vegan spicy green chili sauce I buy at Milams – it has lemon juice, green peppers, cilantro – I only add a little here so you can just probably buy a jalapeno which give a good kick and dice only a little to add it. This is inspired by “Schug” a green chili pepper sauce commonly on the table at Yemeni places and topping falafel to make it spicy if you want it!) Then add nice green Israeli olive oil. Add tehina. A little sea salt. Shake. – Once the cauliflower and oranges are out of the oven allow to cool on the stove top on the sheet tray it was roasted in. Break apart endive into spears and place in a large bowl with chopped crunchy small cucumbers and cubed hass avocado. To a separate small bowl add sliced yellow grape tomatoes (did you know Israeli’s invented these!?) length wise and toss with some squeezings of the roasted orange juice, more green onion, the good green israeli olive oil, sea salt and freshly cracked black pepper, and sweet/spicy/zesty paprika. – Once cauliflower is cool, chop into medium sized florets and add to the bowl of endive. Lightly dress with the tehina dressing. Using a slotted spoon, add the marinated tomatoes (you can reserve the juice for something else but dont want the salad too wet.) Sprinkle with fresh za’atar and enjoy! – Place a few small-medium zucchini and eggplant whole on a sheet tray. Drizzle with olive oil and season with salt and pepper. Roast for 30-35 minutes or until softened, wrinkly and deeply browned. – While the veg are roasting, chop spanish onion, shallot and garlic. In a pan over medium heat, sautee in not too much good-ish EVOO to slightly more than a sweat but not caramelized or browned, about 5-7 minutes. Season with some salt and pepper. Turn heat to medium high and add your ground lamb*, baharat and pine nuts. Continuously stir with a wooden spoon for about 4-5 minutes or until meat it cooked through but not murdered and there is very little liquid in the pan. The mixture should just glisten and have a bounce to it. Remove from the heat and set aside until your veg are done! – Let veg sit to room temp so you can handle them. Make a lengthwise incision and open them up. Scoop heaping spoonfuls of the lamb on top and serve! *NOTE ON LAMB: Buy some ground lamb from Milam’s. They have it in the meat section already done – you don’t need to go to the counter with the butcher – it did the job and then some I thought. – While the veg is roasting, make and drain your grains* according to the instructions on the packaging. Set aside in a bowl. – Once cool from the oven, roughly chop the roasted leeks and onions, squeeze out the whole roasted garlic cloves and mix with grains. Crumble the cheese (you can use a firm feta to substitute if you want). Toss to incorporate all thoroughly. To serve, at room temp, grate Persian / dried lime! *A NOTE ON GRAINS: Bob’s Red Mill heritage grains are killer. Use for best results! Delicious generous meal. Reading The recipes bring back the aromas and flavors . Thank you!